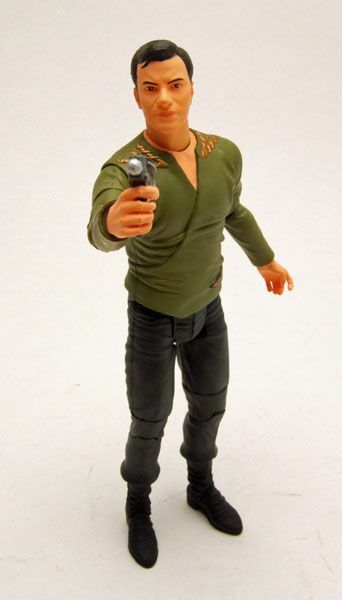 DST released this Kirk in 2010 as part of the "5th wave" of Original Series figures. The Rundown: Gah!?! 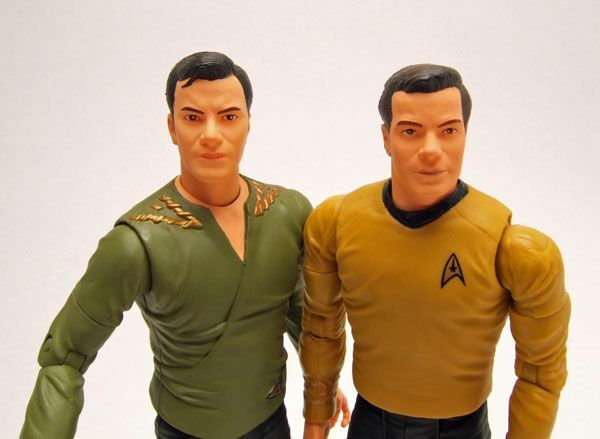 New Star Trek figures from DST!?! It's about time! After a LONG wait, DST is finally shipping it's 5th (and sadly, most likely final) wave of figures based on TOS! The wave consists of the Kirk seen here, a Scotty reissue, and a great new Romulan. Today, we'll take a look at the Kirk... which is AWESOME. Kirk's new head sculpt! 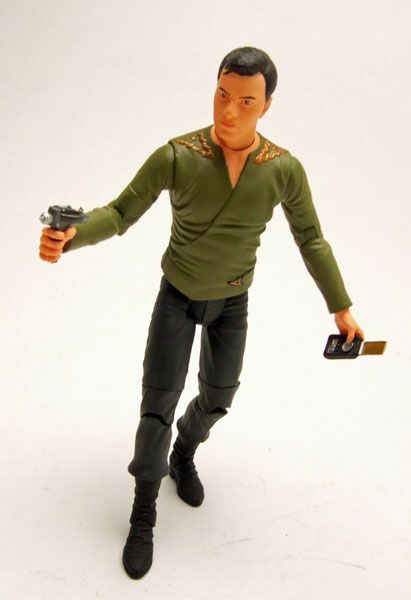 If you are a long-time reader of my blog, you may already know that I've never been all that pleased with the original AA Kirk head sculpt; In fact, it's probably my least favorite of all the head sculpts in the TOS line. Well, throw that head out the window now because there's a new Kirk in town! I absolutely LOVE this new head! While the hair may be a bit dark, the sculpt itself is far superior to the old AA standard. 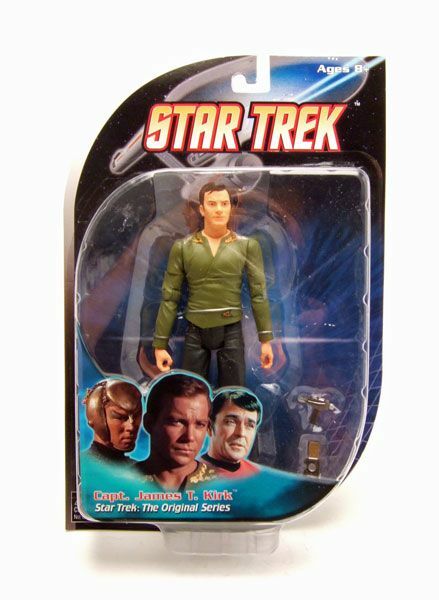 I like it so much that I'm going to be buying multiples of this Kirk just to put the head on the old existing Kirk bodies (more on this later). Moving down from the head, we see that this Kirk figure has a new take on the casual attire, this time opting for the Season 1 wraparound. 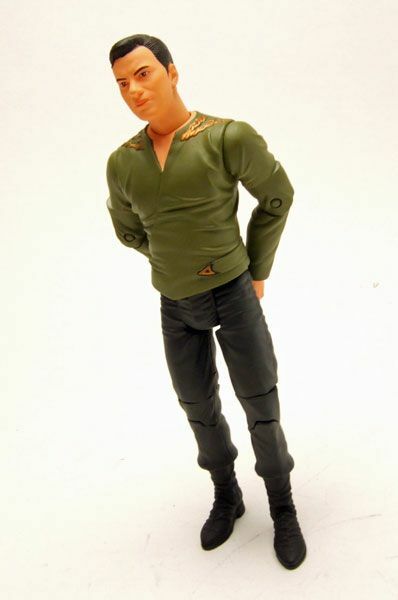 And unlike the other AA/ DST casual Kirks, this one's torso is solid plastic, meaning no more rubbery shirt! Yay! I never liked the rubber shirts, so this is a big bonus in my eyes. The only trouble is that now I REALLY want the regular crew reissued like this (which probably won't happen). Past that, this Kirk is pretty much your standard fare for the line- Great articulation and solid paint apps. I did notice his pants were almost a very dark gray instead of black this time around, which really helps them pop a bit more. 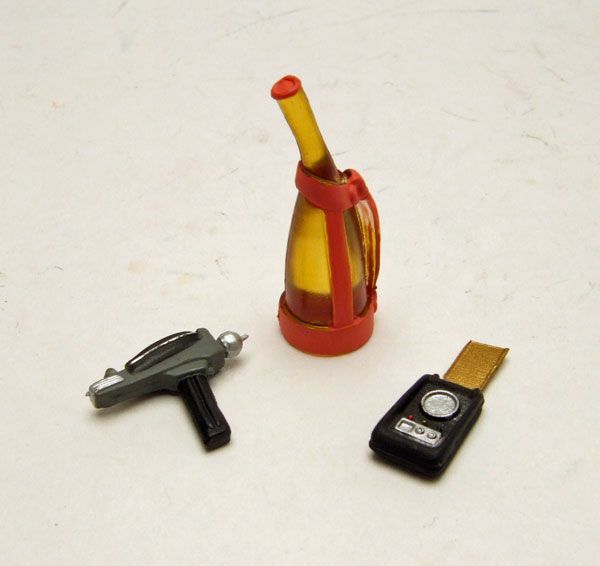 Accessories: Kirk comes with a phaser, a communicator, and the INSANELY COOL bottle of Saurian Brandy! 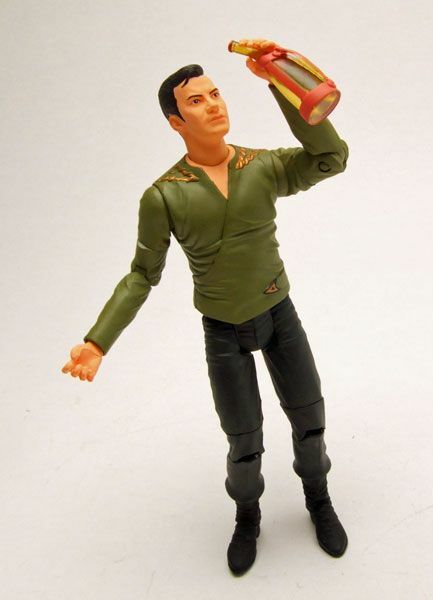 So now your Kirk figure can get drunk and hit on Rand... if we had a Rand figure to hit on. Oh, and surprisingly he doesn't come with any extra hands this time. I seriously can't recommend this figure enough. 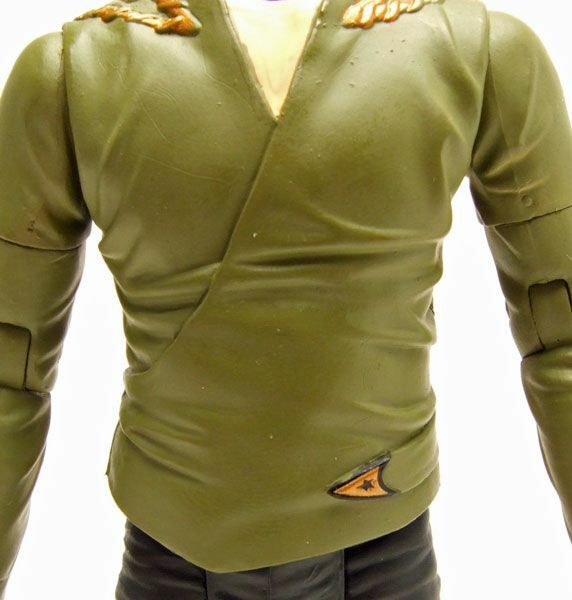 Maybe it's just the fact that I'm holding a new Trek figure for the first time in months, but I really feel like the new head sculpt combined with the excellent work on the shirt area has moved this Kirk to the top of the stack of AA/ DST Kirks. If you are a fan of the DST line, hop on this one... but don't wait! The numbers on this wave are very limited, so they may not stick around for long. My online Trek store of choice, New Force Comics, is currently sold out of the wave but may get more in. 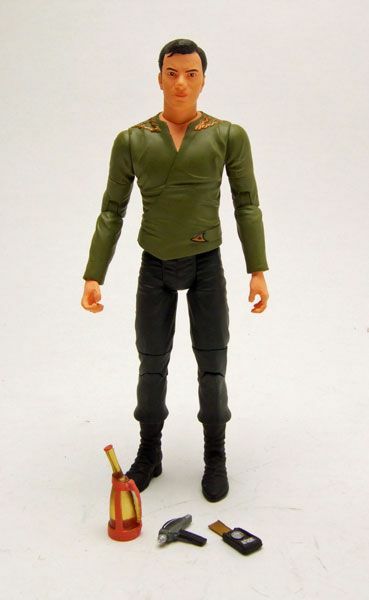 Your next best bet right now is Big Bad Toystore, which has the Kirk available separately or in a set of three for $47.99. I do like the new head and didn't realize it had one. Shatner is apparently nearly impossible to capture in a sculpt. You rarely see a great one. Where does the time and my money go? I have to say your photos do make a case for picking this figure up, the head sculpt does look way better. Hey james, this is otaku5003! 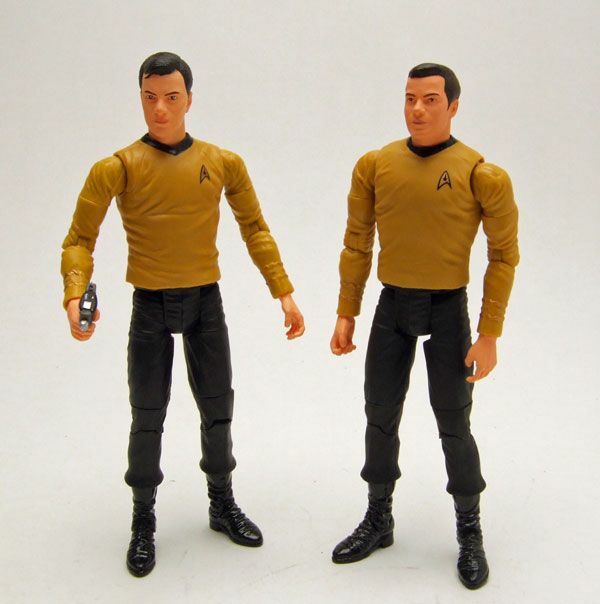 Can i buy the head swapped kirk figure on the left in the final picture from you, i'm offering 20.00! otaku5003- i swapped this kirk head onto the reissue mirror kirk, would you like to buy it from me? Star Trek 'Potpourri' Spotlight- The Glommer!